Catch us at the Critically Queer 2018 conference! The two day event is a diverse programme, with a range of different academic disciplines, activists, artists, and practitioners represented and representing their work. The conference aims to be practical as opposed to theoretical. Private view 5th July 2018. We are very excited to be holding our first exhibition at the National Trust's Sutton House in Hackney Central, London. The exhibition will showcase GCSE art coursework produced by a class in North London. The students' artwork explores the topics of gender and sexuality through ideas such as ambiguity and reading queerly. The members of the class are from diverse cultural backgrounds varying in ability. The exhibition seeks to investigate gender and sexuality in various art mediums, including photography, sculpture, video and drawing. Workshops- 6-8pm, 10th July 2018, Sutton House, National Trust. 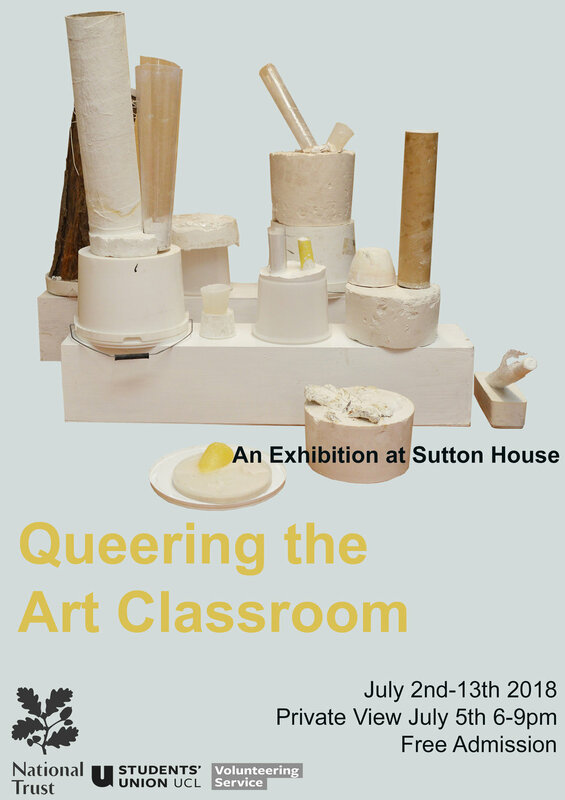 We hold workshops for teachers, PGCE students and local community members who express an interest in wanting to Queer the Art Classroom. We run the workshops alongside lectures on the topics of queer theory and art education. We have a workshop running at Sutton House 10th July 2018. If you are interested in joining our workshops, please contact us for more information.